It’s spring. Have you noticed that the birds are singing? This is the time of year when they are most vocal. They are staking out their nesting sites and attracting their mates with their songs. They are quieter when they have laid their eggs as they try to avoid detection. Migratory birds are also passing through, on their way to their breeding homes. The food they find along the way is important to their survival on their long and physically challenging journeys from their winter to their summer homes. 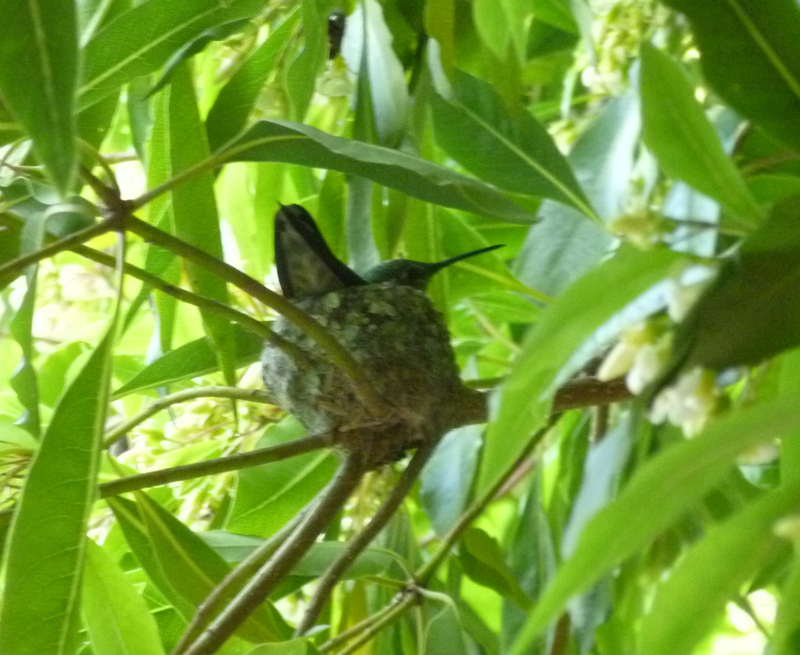 We were recently reminded of the vulnerability of birds at this time of year in our own yard when a hummingbird selected our flowering, non-native Victorian Box tree (Pittosporum undulatum) to build her nest. Her nest was completely invisible to us, but we spotted her darting in and out of it as she built her nest. We were able to take this picture of her sitting on her nest by crawling into the understory of the tree. 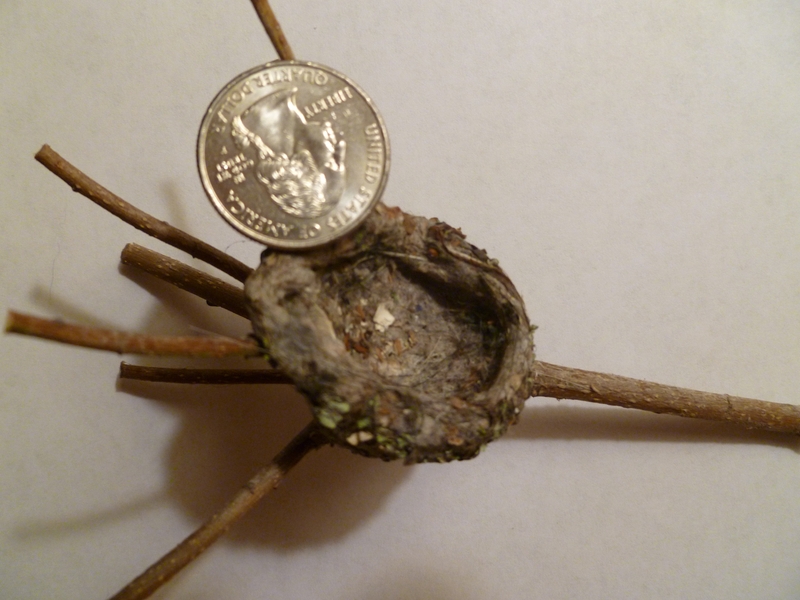 Hummingbird nest is not much bigger than a quarter! Then disaster struck. An early spring storm tore a huge branch from the tree and sent her nest tumbling to the ground. We watched with heavy hearts while the hummingbird made anxious, noisy flights into the fallen branch. When she gave up, we carefully lifted the fallen branch to find her tiny, empty nest. As sad as this event was in our lives and hers, at least we knew that the failure of her nest was no fault of ours. San Francisco’s Natural Areas Program cannot say the same of their destructive project in Glen Canyon Park. 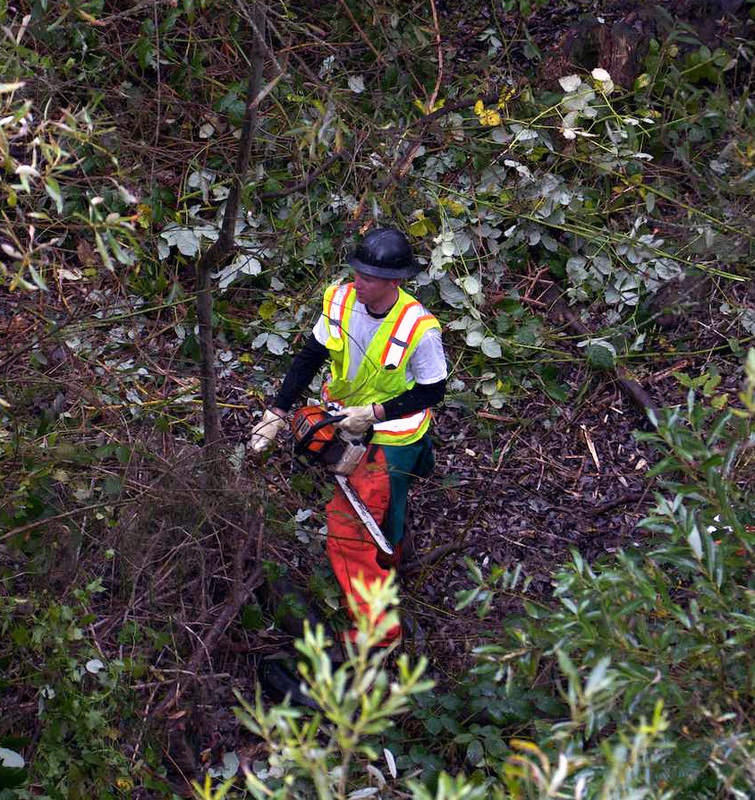 The Natural Areas Program began to destroy the non-native vegetation in Glen Canyon Park in San Francisco in November 2011. In addition to destroying valuable habitat with chainsaws, they also sprayed herbicides. 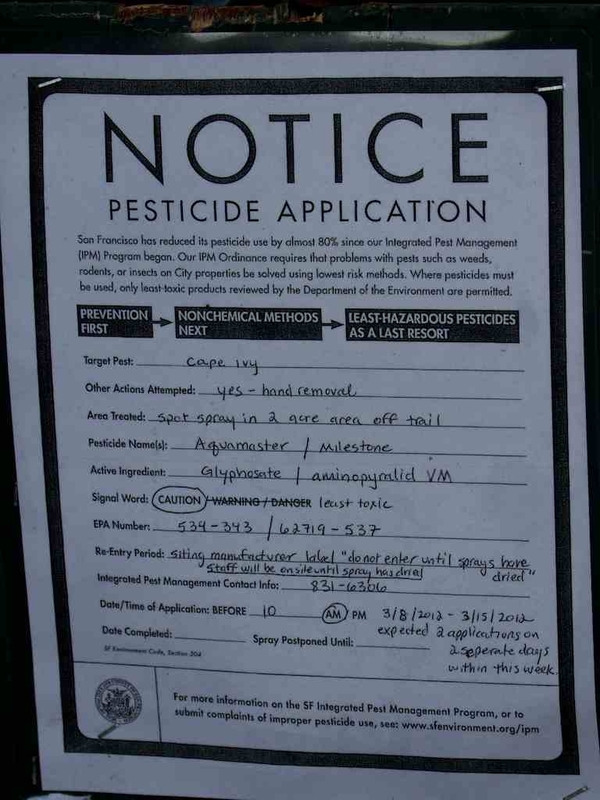 The San Francisco Forest Alliance (SFFA) protested this destructive project many times but it has continued unabated to as recently as April 27, 2012, when they pruned trees and sprayed herbicides. SFFA brought this violation of its commitment to the attention of the General Manager of the Recreation and Park Department immediately. The head of the Natural Areas Program said that the violation was necessary because the grant funding for the project was about to expire. To avoid losing the funding for the project, the birds and animals of Glen Canyon Park were subjected to this destructive project during their breeding and nesting season. One month after SFFA informed California Department of Fish & Game of the violation, nothing seems to be done about it. In fact, weeks after SFFA sent this information to Fish & Game, another episode of destruction occurred in Glen Canyon Park on April 27, 2012. We will never know how many birds and animals were harmed by the destruction in Glen Canyon Park. The management plan for the Natural Areas Program tells us (Appendix D) there are 18 species of birds that are found in and/or breed in Glen Canyon Park that are considered “Species of Local Concern.” That is, the Audubon Society considers them rare in San Francisco. Ironically, this project was partially funded by a grant program of the State of California entitled “Habitat Conservation Fund.” We believe this project was a grotesque misuse of this fund. The wildlife of Glen Canyon Park did not benefit from this project. In fact, we believe they have been harmed by it.